Gemini, a kitten who was born with two faces on Wednesday, has died after 48 hours. Gemini had four eyes, two noses, two mouths, two ears and 24 toes – seven on each front paw and five each on the back. His owners in Providence say he had two tracheas going into one throat. The women fed him milk by bottle because he ate very slowly. 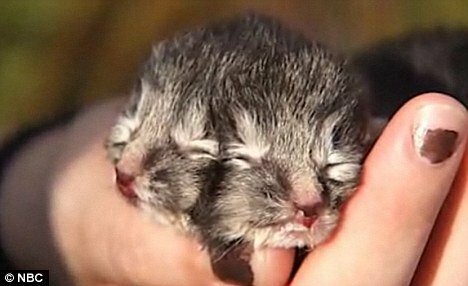 Part of a litter of five kittens the owners told NBC that they were “very, very surprised” by the two-faced kitten. “We think he’s beautiful…adorable,” the proud owners told the news station on Thursday as they stroked the tiny black kitten. Veterinarian Ernest Finocchio, president of the Rhode Island Society for the Prevention of Cruelty to Animals, says he’d never seen such a kitten. He believes Gemini could have been conjoined twins that didn’t separate properly. The owners hoped Ernesto Finocchio could carry out an ultrasonic examination on Gemini to determine his life expectancy and advise them on how to look after him. However, the kitten died before an examination could happen. Two-faced kittens are very rare and seldom survive. The other kittens in the litter are healthy and feeding from their mother, the owners said.